MODESTO, CA--(Marketwire - February 3, 2010) - Enduring daily challenges like long commutes, marathon conference calls, last-minute deadlines, workouts and other stressors can often feel like a minor-league version of Discovery Channel's "Man vs. Wild" with hunger being one of the first things to fall by the wayside. According to the Almond Board of California's North America Snacking independent survey, consumers snack about twice a day, and men in particular are looking for filling and satisfying snacks with protein. (1) Bear Grylls' satisfying snacking tips and survival strategies (including great almond recipes) can help men conquer life's every day hunger and challenges. As a seasoned adventurer, Grylls is on a mission to share survival techniques he uses to overcome hunger in the extreme wild, including his favorite snack. But even when he isn't out in the wild, he uses the same basic guidelines to stay nourished. His typical diet includes whole, unprocessed foods like almonds, fruits, vegetables, whole grains, soy, avocados, beans and oats. He tries to eat five times a day for sustained energy and chooses foods with protein, fiber, monounsaturated fat and unprocessed carbohydrates to stay full. "It's important to always have a satisfying snack on hand, with a good combination of fiber and protein," Grylls said. "Almonds are the ultimate survival food and the perfect snack -- they're portable and tasty!" 1. Don't leave home without survival food. Almonds are the ultimate survival food in extreme conditions and everyday life. They are lightweight and don't perish in cold, wet, or heat. I keep them tucked away in a waterproof pocket or resealable bag for emergency snacking when I'm out hiking or mountain climbing with my family. 2. Be heart-smart. I try to do something that will get my heart pumping every day and I choose heart-smart foods like almonds. 3. Fill up on satisfying snacks. Once I eat a handful of almonds, I'm full and I stay full. That's because they contain protein (6g), fiber (3.5g) and monounsaturated fat, allowing me to fight hunger for longer periods of time. 5. Snack on wholesome foods. I don't exactly eat tasty food on "Man vs. Wild" missions. But before I head out, I eat simple, wholesome foods as nature intended. One of my all-time favorite snacks is almond butter with smashed banana on whole-grain bread. 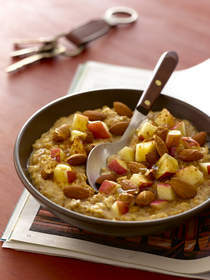 -- Hearty Apple Almond Oatmeal (photo available) -- start your day with turbo-boosted instant oatmeal mixed with almond butter, a handful of whole natural almonds and diced apples. -- Spicy Crunchy Tuna with Almonds (photo available) -- keep these ingredients in your desk drawer for an easy-to-assemble afternoon snack packed with hunger-busting protein from almonds, beans and tuna. -- Chipotle Roasted Almonds (photo available) -- this extremely easy recipe turns just five ingredients into a salty-sweet snack staple. Roast a big batch for football Sunday and carry the rest with you during the week. -- Almond Butter on Whole Wheat Toast (photo available) -- snacks don't get any easier than this: get your protein fix with a smear of almond butter on hearty whole wheat toast for a quick snack with major staying power. 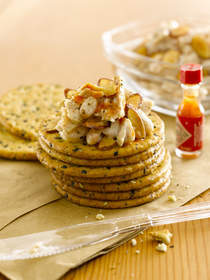 -- Almond Parmesan Crisps (photo available) -- with only two ingredients, they're a snap to make. Contact Christine Books at (617) 897-8242 or christine.books@porternovelli.com for full-color, high-resolution photos of the recipes. (1) The Sterling-Rice Group, Boulder, Colo., April 2009. North America Snacking: Consumer Quantitative Study. (2) Scientific evidence suggests, but does not prove, that eating 1.5 ounces per day of most nuts, such as almonds, as part of a diet low in saturated fat and cholesterol may reduce the risk of heart disease. Click here to get the Spicy Crunchy Tuna with Almonds high-resolution photo. Click here for the Apple-Almond Oatmeal high-resolution photo.